Shiksha Bharati Public School, Sec-7 Dwarka, Organized International Day for the Preservation of the ozone layer on 16th September 2013. Ozone filters the ultraviolet rays of sun and makes these rays safe for us. But due to unmitigated bussing of fossils fuels, the ozone is depleting. Scientists have warned that the further depletion of ozone will create lots of troubles for us. So to save ozone Shiksha Bharati Public School organized a programme to increase the awareness among young progenies. Students from 6th to 8th Class participated with full zeal. 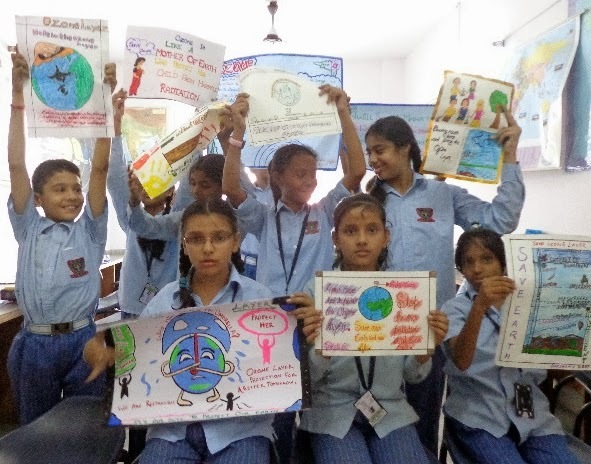 They designed attractive posters with valuable slogans, they delivered speech on the importance of ozone, and they made charts showing the dangers of the depleting of the ozone. Principal Madam inspired the Students with her enthralling speech. Mr. Deepak Verma- Geo. Tr. conducted the programme very nicely and hon’ble Manager of the school gave away prizes to the meritorious participants.